We are not sure; yet we have reason to believe that the exposure in ORISSA MATTERS has forced secondary education officials to give a silent death to a blatantly illegal order issued by the Director of Secondary Education, Orissa in matter of a private High School we had cited as an instance. The exposure was in two parts. The first part was captioned: Fish Market continues in the Directorate of Secondary Education:An Instance, and the second part was: Hub of manufacturing forged Certificates runs with the support of the Education Officials. When one Dhobanath Sahu had run away from a school – Sankarsan Godi Godisahi Bidyapitha after his offenses such as manufacturing and marketing of forged certificates and misappropriation of funds and clandestine selling of school furnitures came to the notice of the Managing Committee, pending disciplinary proceedings, the MC had demoted him from the post of Head Master In-Charge ((HM I/C) to the third position in its faculty list. As the School became eligible for block grant and the Directorate of Secondary Education wanted the faculty list for approval of their appointment, the MC had submitted the list with Sahu in the third position. But, the Government did not consider him worthy of approval as a teacher. Despite this, after many years of abandonment, when it was clear that the block grant would proceed into 100% grant-in-aid entitling the teachers to draw regular and full salary in time scale, Sahu managed to obtained a mysterious order from the Director of Secondary Education that declared him reinstated with retrospective effect in the post of HM I/C of the concerned school. And, it was stated therein that the Director has quashed his retrenchment! When Sahu was never retrenched, quashing his retrenchment was, if anything, a trick contrived to confuse the MC in serving Sahu’s interest instead of the school’s interest. 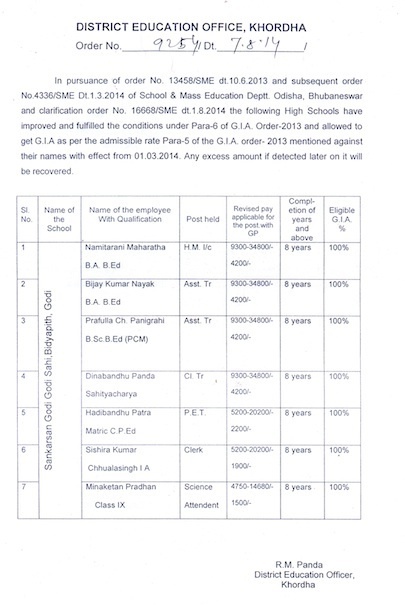 Exposed to the core, the mandarines have given the order of reinstatement of Sahu as HM I/C issued by the Director a silent death by projecting Ms. Namitarani Maharatha as the HM I/C in an order promulgated yesterday (7 August 2014) bearing the cadre list of teachers of the same school, where Sahu’s name has no mention even. Yet, it is imperative that the Government in the Department of School and Mass Education should take action against the Director and his team that had contrived the tricks to impose Sahu on the school as HM I/C instead of handing him over to police for the serious offenses he committed before absconding. We will keep an eye on this matter as a matter of a case study. Lot of thanks for your articles time to time. Now I am sending you some details of a school and request to publish this. Pl refer to recent self immolation of two minor girl students in Odisha High School in connection with unauthorized fund collections. I am writing this regarding such a school where Officiating Headmaster Mr Avimanyu Panda has collected unauthorized funds Rs 200/- each from 94 Class VIII students (UNDER SARVA SIKHYA AVIJAN WHERE NO NEED OF SUBSCRIPTION ), Rs 235/- each from 87 students of Class IX including my son and Rs 225/- each FROM 131 class X students on 25 Jun 2014. Valid bill not yet provided with. Despite my request to student helpline and Secretary Mass Education No repeat No reply has been received yet. Kindly take this matter an urgent and intense. The concerned Director must be Jailed for 7-years for vitiating the academic atmosphere of the country.